January 01, 2018 / Roots & Burls East Asian Medicine Clinic/ Renee Klorman, L.Ac. Several years ago I was introduced to the Qigong teachings of Wang Fengyi after a friend travelled to China to study with a disciple of his. There are no books that teach how to do the qigong that he taught; it is all through oral transmission. In fact, my friend and a handful of other Chinese medicine students and practitioners were the first Westerners to ever experience this style of qigong healing. Most know Qigong as a movement meditation, but it is also a whole medicine when sound and visualizations are practiced with the movements. It was not long ago that entire hospitals (aka Medicine Free Hospitals) in China used Medical Qigong to heal diseases. The foundation of Wang Fengyi's teaching is that the roots of dis-ease begin as emotional seeds planted in our past --particularly emotional wounds that come from family and ancestral history. To heal these wounds (and your dis-ease), Fengyi led people through exercises to cultivate whole-hearted compassion for the person(s) who inflicted the wounds, and taught them how to use qigong movement and sound to heal the roots of the wounds. The "exercise" I'm sharing with you from Wang Fangyi's teaching, serves two purposes. The first is to recognize how many ways we wound ourselves, and as a result wound others. The second is to rewrite brain patterning that keeps us repeating the same emotional habits that harm ourselves and those around us. In other words, consider it a thorough cleanse for your mind, body, and spirit. Here is the exercise: for the next 8 weeks simply "do not blame." Do not blame anyone. Do not blame others. Do not blame yourself. I know, it's such a simple thing and yet it will unfold you, layer by layer, peeling away places you have disempowered yourself. As blame leaves--we can return to our center. I did this exercise last year, and it is not hyperbole when I tell you, it changed the trajectory of my life. I posted some of my thoughts about it on Instagram (post below) last February, a day after the 8 weeks. If you really commit yourself to the 8 weeks, you will be able to access this powerful medicine anytime to keep you grounded and present. Instagram post from February 18, 2017. 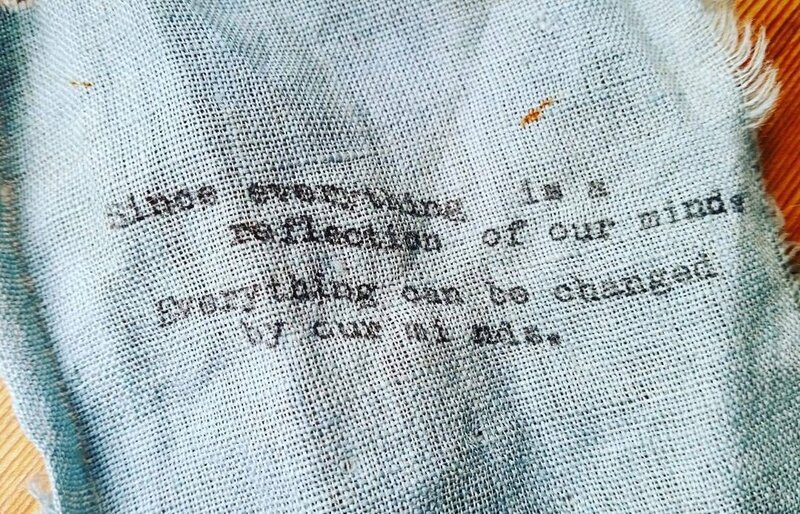 "I stumbled upon this scrap of fabric today. If you don't read old manual typewriter, it says "since everything is a reflection of our minds, everything can be changed by our minds." Finding this little treasure was so appropriate because for the last 8 weeks I’ve been doing this exercise which is “to not blame” —anyone, others, myself. The exercise is so simple and yet once I started, I quickly noticed how much language binds my heart. That literally every word I think, say, and see sends a message that burrows into my mind, body, spirit. In Chinese, the character for Heart (心) is also used as a radical, which is a component of a word to help you identify its meaning. The heart radical is part of words like ethics, morality, virtue, sincerity, charity, endure, kindness, mercy. It’s also the radical for neglect, anger, rage, passion, secret, sorry, grief, worry, mislead. The list is very long, but you get the idea. After 8 weeks (which is the minimum time suggested by a teacher) I’ve learned that compassion begins where blaming ends. Blame is a tool to push things further from your heart. Blame is a tool of oppression and fuel for ignorance. Blame is a weapon to disempower... Consider all of this next time you read the news, or engage in gossip or turn words on yourself." For more information about Wang FangYi, I recommend this post by Sabine Wilms, PhD. She is a translator of Chinese and Classical Chinese, and has translated two books on the teachings of Wang FangYi.